‘Belgian producer Mickey makes music that’s just like his country’s chocolate: sweet, smooth and oh-so-enticing. Last year’s Exploited releases ‘LA Anyway’ and ‘Holding Hands’, especially the latter, are exactly that, not forgetting the stunning ‘Sweet Baby’ and remixes of Sébastien Tellier and Claptone. Featured on upcoming DJMag Selection 01 Compilation + early support by BBC Radio1/Danny Howard, dOP, Erol Alkan, Totally Enormous Extinct Dinosaurs, Martin Landsky, Laurent Garnier, Tensnake, Riva Starr, ZDS, Arthur Baker, Miguel Campbell, DJ T, Sasha, Bag Raiders, Wildkats, Kasper Bjoerke, Waifs & Strays, Noir, Mia Dora, Laidback Luke, Sonny Fodera, James Curd, Moodymanc, Pezzner, Kyodai, Nils Nuernberg, Crackazat, Brett Johnson, Compuphonic, James Curd, PJU, Jamie Anderson, Sinden, Phonique, Khan, Smash TV. Mickey starts the New Year with another great anthem. 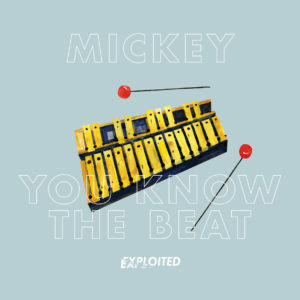 ‘You Know The Beat’ is a mixup of 90ies French House, combined with a classic old school American House Vibe and Groove. Think Cassius meets Todd Terry. We saw Mickey, as a newcomer, growing on the label Exploited. His releases ‘Sweet Baby’, ‘Holding Hands’ and ‘Walk Away’ are topping our label’s bestsellers of the year 2014. His track ‘Sweet Baby’ was among the Top 10 best selling tracks at Beatport in the genre Deephouse. Next to his Belgian residency at the infamous ‘Libertine Supersport’ nights, he travels all over the world to rock the crowd with his energetic DJ sets. He just finished a remix for Australian ‘Modular Label‘ stars ‘Bag Raiders’ and is currently in London working on his next single. Design by Neven Cvijanovic / Floor 5. Illustration by Laura Junger.